4 [[underline]]ASK LETTERS ON BOYCOTT[[end underline]] The Quad-City Coalition is sponsoring a letter-writing campaign in support of the nationwide United Farm Workers lettuce boycott spearheaded by Cesar Chavez. Target of the campaing will be Sen. Robert Dole who to direct Republican appointees, who control the National Labor Relation Board, to withdraw a petition for injunction in Federal District Court of Fresno, Calif. against the boycott this summer a coalition spokesman said. The injunction is being sought under provisions of the Taft-Hartley Act prohibiting seconday boycotts. The farm union formerly was exempted from the Taft-Hartley restrictions. [[underline]]Chicano Banquet April 9 (7:00-9:00)[[end underline]] Saturday evening was the American G.I. Forum 6th annual banquet honoring Chicano High School graduates. Serving as M.C. for that evening was yours truly, sacred stiff Alberto Olvera. Guest speaker for the evening after dinner talk was our very own Pete Rael accompanied by his lovely wife, Betty. Pete's talk for the evening was on University life, Law, and the Chicano-Indian Student Union. The G.I. Forum of Davenport, Iowa and Moline, Illinois have been doing this banquet for six years. The banquet used to be a combined effort by both G.I. Forum Chapters, but as each group became more organized each chapter began to stick to there own side of the river. The purpose of these banquets is to encourage the Chicanos to continue their education after high school. Pete stressed this point when he gave his speech, stating that "you don't have to have all A's and B's to go to college". Following the banquet and speech a dance was held with the music being supplied by Los Macombos. After the dinner and speech, I went around and talked to some of the Chicanos that were on hand. It appears that most of them do want to continue their education and possibly at the University of Iowa. [[underline]]Chinese Find Raza[[end underline]] The visiting team of Chinese Table Tennis Players had little trouble showing why they were number one in the sport of ping pong. Last Friday night the Chinese took on the Americans to see who was best. The teams played six international matches and the Chinese won five of them (Shale) The Matches marked the start of a two week American tour by the Chinese team. The players practiced table tennis for three hours after visits to a Chicano community Center and a Model Neighborhoods Program Health Clinic in Detroit's inner-city, in the morning. 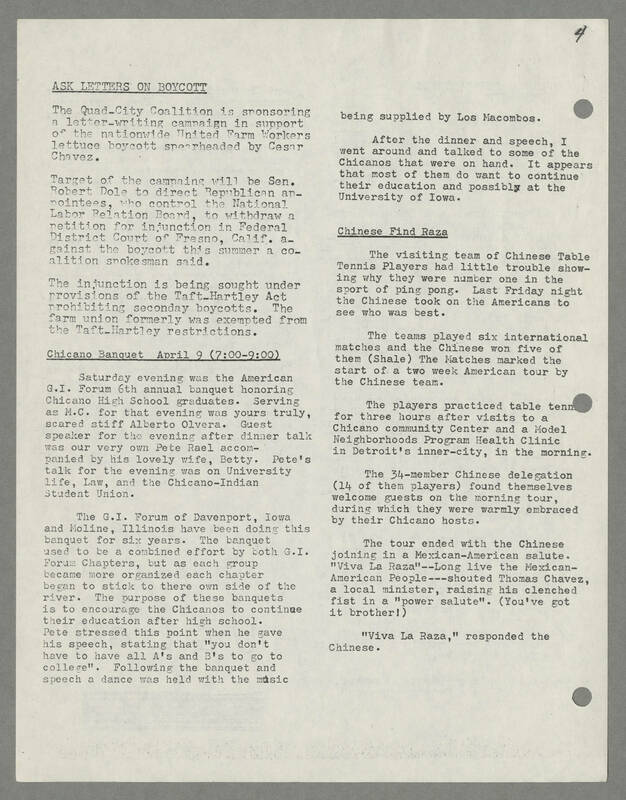 The 34-member Chinese delegation (14 of them players) found themselves welcome guests on the morning tour, during which they were warmly embraced by their Chicano hosts. The tour ended with the Chinese joining in a Mexican-American salute. "Viva La Raza"--Long live the Mexican-American People---shouted Thomas Chavez, a local minister, raising his clenched fist in a "power salute". (You've got it brother!) "Viva La Raza," responded the Chinese.